SlantView is the analytics toolset that transforms raw data from airborne sensors into valuable information for farmers. For information to be valuable, it must be both actionable and available when and where it’s needed. Diverse and customizable information types can be tailored to the farmer’s immediate needs through advanced computer vision and machine learning techniques. Those information layers can be delivered in a matter of minutes. Anywhere. SlantView is a transformative analytics solution that will enable small UAS measurements to reach all of the world’s farmers, not just those with access to high-end computing resources. Read on to see some of the new types of information products SlantView is already producing. What would you like to know? That of course depends on what types of crops you’re raising, what time of year it is, where you’re located, and a number of other variables. Your information needs are specific and evolving. SlantView is the only airborne agronomy analysis tool that has the versatility to serve those changing needs with more specific and actionable types of information. Your needs are specific, so what is it you’d like to know? For many crops, the first few weeks after planting are a critical stage during which plant populations and weed pressures need to be evaluated. Using the latest in computer vision and machine learning techniques, SlantView isolates individual plants for analysis to deliver statistics on stand density, plant sizes, and weed pressure. SlantView’s Plant Population layer provides a true stand count. Unlike other techniques which simply estimate populations by searching for gaps in crop rows, SlantView’s algorithms actually detect each plant in the field and segregate them into crop or weed populations for accurate counts. Populations are indicated in plants per acre as shown in the nearby example. This information layer is designed for use in specific row crops under pre-defined conditions of measurement. The Weed Density layer provides indicators to invasive plant species within early-stage row crops to support more targeted and efficient herbicide treatment. Weed density is indicated by the fraction of local area under weed coverage. 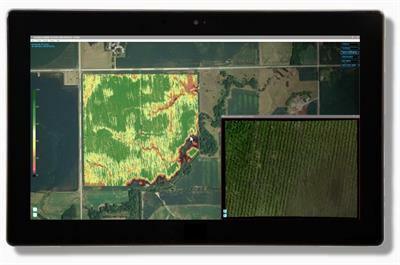 Is NDVI all that you need? Because high resolution multispectral imagery can deliver so much more. SlantView’s full season health surveys include a suite of crop information layers for a comprehensive look at evolving conditions. The Plant Stress layer combines multiple spectral bands across the visible and near infrared to measure pigment absorptance and cellular integrity that are markers for nutrient deficiencies, pest infestations, or dehydration conditions. This information layer enables more efficient and accurate scouting by providing earlier and more comprehensive detection of stress conditions than possible with simple 2-band indices like NDVI. Contact us to discuss custom tuning for specific crops or conditions. The Vegetation Fraction layer indicates the percentage of the field that is covered with the growing crop (also frequently referred to as “canopy closure”). Through the early weeks of the season this value will increase from zero until the fully developed canopy closes. This information layer is valuable for locating mis-planted or thin coverage areas, or for measuring damage from weather or other events. Multiple crop metrics are combined to assess future performance in the Yield Potential layer. This is the producer’s highest level assessment tool and includes the contributions of numerous independent factors that ultimately contribute to yield. At SLANTRANGE, we recognize that grower information needs are incredibly diverse, and that generic measures such as NDVI maps rarely supply actionable information. In 2016 we introducedan incredibly powerful new tool for instantly customizable data layers. The potential applications are immense. So what is your specific information need? Do I have a leaking irrigation system? What is the extent of my greensnap/lodging problem? Which stress areas are due to this infection? Where is a particular noxious weed emergent? Algorithms newly embedded into SlantView enable signals training and classification for a wide range of specialized capabilities. In the example below, the operator trained SlantView to separate generic “low-NDVI” areas in a newly planted alfalfa field from nutrient deficient areas that resulted from a leaking irrigation system. All in just a few clicks and while in the field. Similar signals training and classification has been used on numerous applications in different crop types. What is it you’re looking for? The Red-NDVI layer shows varying levels of health condition, most of which are known to the farmer as resulting from varying soil types and drainage patterns. NDVI however can’t reveal the farmer’s real concern. The farmer’s real concern was a leaking irrigation system. After running SlantView’s Smart Detection algorithms, nutrient deficient areas exhibiting higher than normal soil moisture content were quickly identified (shown in image at right in red/yellow/white indicators). Conducting a similar survey traditionally takes 2 days for a scout on foot. SLANTRANGE results are available on-site within an hour. It’s hard to beat centimeter-resolution imagery for perspective in diagnosing field conditions. In addition to our information layers, SlantView also delivers your full-resolution results without the image compression that compromises other techniques. See an area of concern in your maps? Instant zoom provides the complete picture on conditions in your field. Agronomic data is both precious and perishable. So minimizing the time spent collecting and processing data is a primary objective for SLANTRANGE. We’ve developed new technologies that will not only dramatically reduce your time spent collecting data, but will deliver results in minutes, anywhere. Traditional mapping techniques don’t make sense for agriculture. 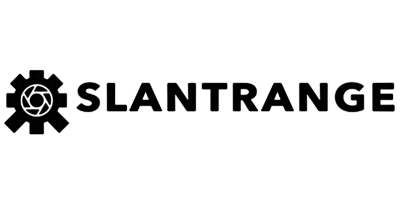 SLANTRANGE’s patent pending algorithms require only 20% overlap, compared to industry standards of 70-80%. That means you can cover a field 4x faster than using similar sensors at similar resolutions. Put another way, your quadcopter system can start competing with fixed wing systems for area coverage. What will you do with all the extra time? The cloud just doesn’t reach everyone. Uploading gigabytes of your raw data for processing is a costly and sometimes unavailable option. SlantView processing is so much more efficient, it can be done in minutes right in the field. No network connection required. No additional work back at the office. Collect, analyze, and act all in one visit to the field. SLANTRANGE data only becomes more valuable when it can be analyzed together with your other field data: soil maps, planting maps, weather, last year’s yield maps, etc. The list goes on. SlantView will export your information layers in multiple industry standard formats so you can easily and seamlessly combine all of your data sources in your favorite data management tool for your total field picture. Have another preferred drone imagery analytics tool? SlantView also exports full-resolution, fully calibrated reflectance imagery with all of the embedded metadata necessary to build your own maps and conduct your own analysis. This video provides a tutorial on how to process data in SlantView. No reviews were found for SlantView - Analytics Tool Software. Be the first to review!